"Russia is a riddle wrapped in a mystery inside an enigma." Winston Churchill's famous words still reflect the fascination the territories of Russia and Ukraine hold for much of the world. These lands, neither purely Asian nor purely European, have developed in isolation from the rest of the world, giving them a unique identity and mystique. You will find no place in the world where people of all ages have a better understanding of the arts, whether classical music, literature or the visual arts. These countries possess a deeply rooted appreciation for the arts that cultivates prodigious and varied works. Perhaps it is because of the harshness of the climate and lack of material wealth here that people have gravitated to the aesthetic pleasure arts provide. Wherever you travel throughout these territories you will discover an abundance of opportunities to enjoy classical music concerts, exhibits of wonderful paintings and displays of traditional Russian and Ukrainian artifacts. 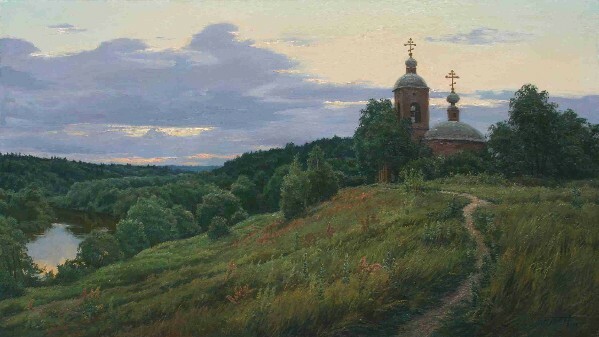 My journeys among the Ukrainian and Russian peoples and my enjoyment of their wonderful and unique works of art have inspired me to share these treasures with my native territory of North America. I believe that once you become acquainted with the beauty of Russian, Ukrainian and former Soviet art you will share my enthusiasm for these captivating works.